15 x 30 West Coast Frame tents are durable enough for everyday use and can fit up to 75 people. They are designed for fast and easy setup. 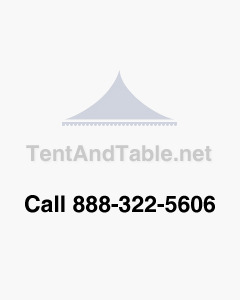 This 15 x 30 tent is great for outdoor events, including weddings, graduation parties, birthday parties and more. Frame tents do not require center poles, which provides optimal space inside the structure. This 15' x 30' West Coast Frame Tent features a rigid anodized aluminum frame and galvanized steel fittings. All our west coast frames use a 2" diameter single tube anodized aluminum pipe. With fittings manufactured from 1.25" schedule 40 steel pipe and finished with a zinc plating. The tent top is made from 16 oz block-out PVC coated polyester material that is flame and mold mildew resistant and features: 1" heat-sealed overlap seams, polyester sidewall rope fastened with polyester webbing, replaceable sidewall rope, 2" nylon webbing and multi-layered reinforcement at all pole locations and identification and flame certificate label heat bonded to each top. West coast frame tents are an expandable system. This means that the same components, pipes, and fittings can be used to build a variety of different sizes. Many rental customers prefer this system because with only 5 different lengths of pipe and 6 different fittings they can assemble 8 different common tent sizes. Tent Legs - 6' 8"
Hip Rafters - 6' 10"
I used west coast frame tent from Party Tents Direct for my graduation party. It looked splendid and setting it up was also easy. It was the best decision I made. My store has about 1 to 5 different tents but Party Tents Direct tents are widely popular among party organizers. I am sure it’s a great product indeed. It is an excellent and reliable product. Whenever I want to buy a tent, I prefer Party Tents Direct.